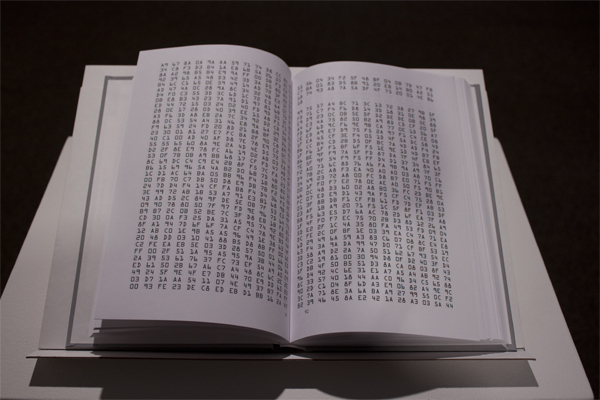 This book contains letters, numbers, a computer code, and an image. It is a self-portrait created for Self is a River, an exhibit opening at the McLean County Art Center in Bloomington, IL on January 9, 2015. The title of the exhibit was inspired by the philosopher Heraclitus’ claim that the nature of things and being is ever changing. He used a metaphor of a river to illustrate his thoughts, asserting one could not step into the same river twice. By using themselves as subject, artists throughout history illuminate the changing nature of life. 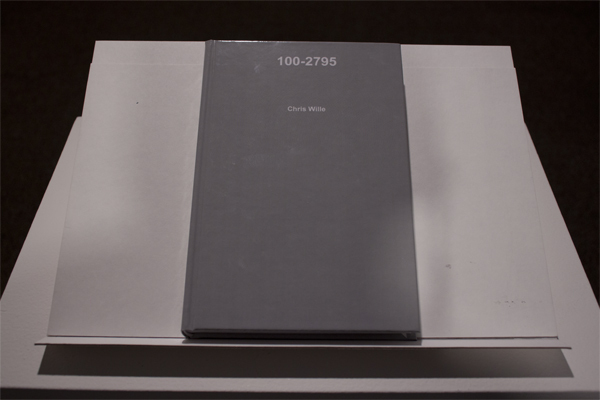 Through his art, Chris Wille explores technology, science fiction, warfare, and dystopian themes. He challenges the viewer to gaze at the uncomfortable and push past it to insights into our human condition. His process and materials are as important as the work’s appearance. To read 100-2795 would be painful and impossible without a translator. 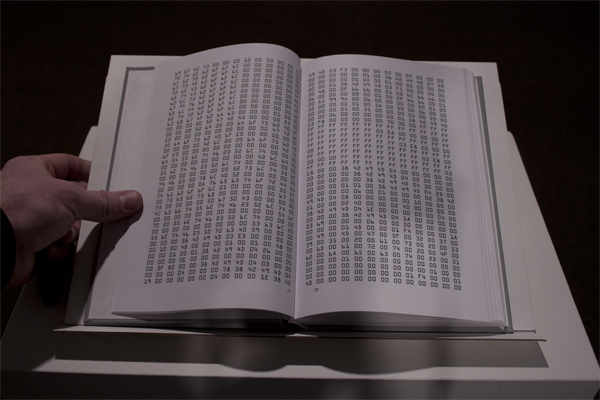 If one spends time with this work and types the printed code into a hex editor an image of the artist will appear. Wille has hidden his image from the viewer, to see him takes time and interaction. Layered within Wille’s work are metaphors for human to computer to human interaction. In this book that is reflected with image to code to image and a reference to the past. He returns us to the beginning of computer programming. Reminding us that once programs were written on paper because the computer that could read our typing was still being born in human hands. We point at technology as one of the reasons life feels it is speeding faster and faster forward. With this book Wille slows it down. Wille created the image. Then gives us the code. Each letter and number is a small piece of information within an image, all 300 or so pages. It is up to the viewer to type the code to see. A quick copy and paste is not an option here.